Conners 3 Full Form User's Package includes: Manual, 25 Parent/Teacher/Self-Report QuikScore Forms. Forms updated with DSM-5 Scoring. Children and adolescents (6-18 years). Potential users include school psychologists, clinicians, psychiatrists, pediatricians, child protection agencies, and mental health workers. The Conners 3 is particularly useful for making decisions about clinical diagnoses and educational eligibility, during intervention planning and monitoring, in research contexts, and for screening purposes. 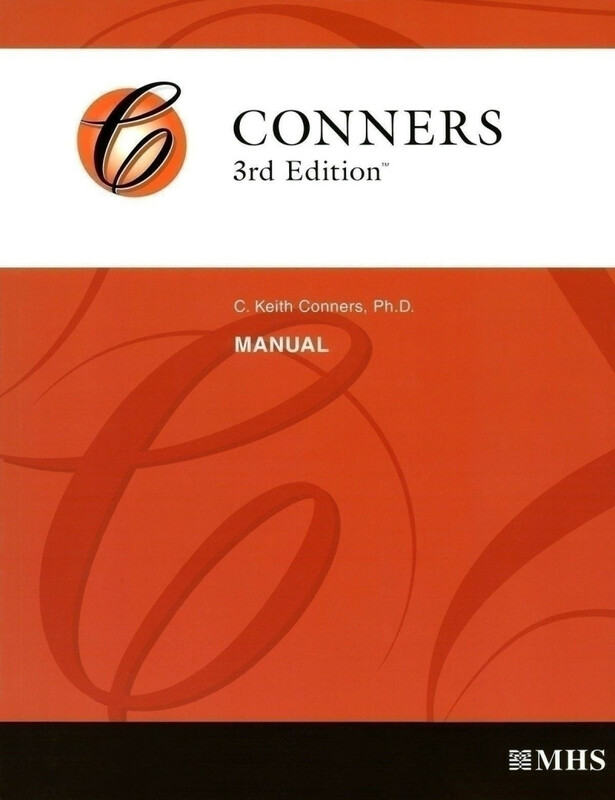 The Conners 3rd Edition™ (Conners 3) is a thorough and focused assessment of Attention-Deficit/Hyperactivity Disorder (ADHD) and its most common comorbid disorders. The Conners 3 is a revision of the Conners Rating Scales–Revised (CRS–R™; Conners, 1997), and integrates the same key elements as its predecessor with a number of new features, including Validity scales, Screener items, Critical items, Impairment items, an assessment of Executive Functioning, and strengthened linkage to the Diagnostic and Statistical Manual of Mental Disorders (DSM-IV-TR). The Conners 3 includes multiple scales and forms: General Psychopathology, Inattention, Hyperactivity/Impulsivity, Learning Problems, Executive Functioning, Aggression, Peer Relations, Family Relations, ADHD Inattentive, ADHD Hyperactive-Impulsive, ADHD Combined, Oppositional Defiant Disorder, Conduct Disorder.The rating scales are available for parent (Conners 3–P), teacher (Conners 3–T) and self-report (Conners 3–SR). In addition to the full-length forms, the Conners 3 also has short forms, and two auxiliary scales: the Conners 3 ADHD Index (Conners 3AI™) and the Conners 3 Global Index (Conners 3GI™). Both test-retest reliability and internal consistency are very good for the Conners 3 scales and indices. Internal consistency coefficients for the total sample range from .77 to .97, and 2- to 4-week test-retest reliability coefficients range from .71 to .98 (all correlations significant, p < .001). The validity of the Conners 3 has been tested for factorial validity, construct validity (including relationships with other related measures), predictive validity (including the ability of the Conners 3 to differentiate between youth with ADHD and those without a clinical diagnosis). A large representative normative sample (N = 3,400 ) based on the 2000 U.S. census data is available. Separate norms are provided for males and females, in 1-year age intervals. Combined gender norms are also available. 20 minutes administration time for the Conners 3 full length versions, 10 minutes for the short versions, 5 minutes for the Conners 3AI und Conners 3GI.